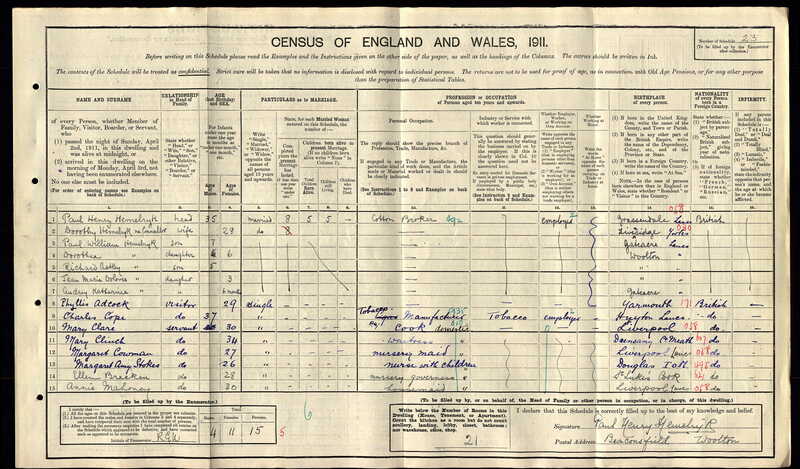 I came across a census entry while carrying out some local property searches in the 1911 census, and found information regarding a property which I had passed many times and knew well by sight. Beaconsfield House is situated in the road of the same name on the outskirts of Woolton village. It is a fairly distinctive property, built from the same local red sandstone as our great Anglican Cathedral, and dates back to around 1833. The current property is a grade 2 listed building but it is not the original House on this site. This was demolished at some time in the past and the present dwelling was constructed from the coachman’s house and stables. What is interesting to note from the information provided by the census returns is just how much the property has apparently changed in the interim period. Obviously the style and decor of the building (both externally and internally) has changed radically to what it once would have looked like, but also the basic use of the buildings has now altered from their original purpose. At the present point in time the property is a very nicely laid out and attractive dwelling house, whereas in the past the structures would have been working buildings first and private homes second. There would appear to be three census returns associated with this site – one each for the stables and coachman’s house’s, and also the main return which applies to Beaconsfield House itself. The stable building originally had five rooms serving as the living quarters and in them resided a family of five people – Arthur Piggott (employed as a coachman), his wife Nellie, plus their three young daughters Beatrice, Elsie and Edna. In Beaconsfield Lodge (the coachman’s dwelling) there lived a family of three people in six rooms – Richard Newsham (a chauffeur), his wife Ella and their three year old daughter, Constance Ellen. 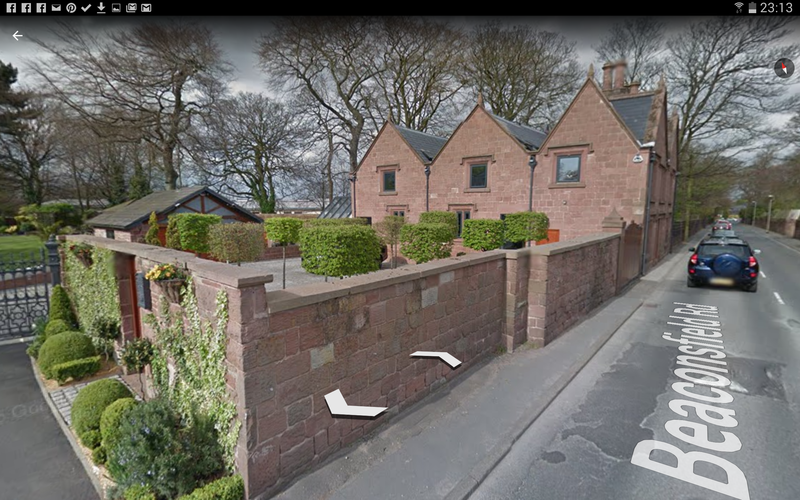 Whereas the two buildings today have been converted to now potentially house a single family, the original properties served as the homes and workplaces of two separate families from the area. However the situation in the main house itself, as can be seen from the census information below, was completely different to the previous two properties. Although I have so far not been successful in finding a photograph of the original building, there is little doubt that the property itself can only be described as a mansion house, and as such an examination of the census record provides a stark reminder of how the lives of the affluent classes of the time differed from the majority of people who lived within the city. The head of the household was a local cotton broker named Paul Henry Hemelryk. As well as being in the cotton trade he was also a Lieutenant Colonel in the British armed forces. He lived at Beaconsfield with his wife Dorothy and his five children – Dorothea (6), Richard (5), Jean Marie (3) and Audrey (aged 6moths). Paul and Dorothy were 35 and 28 years old respectively in 1911. On the census there were two visitors in the property at the time the return was completed by Mr Hemelryk himself, but in the property there were also a total of six staff to cater for the family’s needs. Reminding us today of such TV shows as ‘Upstairs, Downstairs’ and ‘Downtown Abbey’, the Beaconsfield staff were all listed on the return as being ‘servants’ but having different occupations. Mary Clare aged 30 from Liverpool was the cook, while 34 year old Mary Clinch was listed as being a waitress who hailed from County Meath in Ireland. Another local girl was Margaret Cowman, the 27 year old nursery maid; while the children’s nurse Margaret Stokes was born in the Isle of Man in Douglas. The nursery governess, Ellen Bracken (28), was another Irish girl born in County Cork; while the final member of household staff, Annie Mahoney aged 30, was also a local lass from Liverpool. It seems as if the only people missing from this list would be a footman and a butler, but perhaps they were not due to start work with the family until the following week…we shall perhaps never know. This entry was posted in Genealogy, Writing and tagged "Woolton Village", affluent, beaconsfield house, butler, cook, cork, cotton trade, cotton trader, county meath, downton abbey, footman, governess, ireland, Isle of Man, Liverpool, liverpool mansions, nursery nurse, paul henry hemelryk, servants, upstairs downstairs. Bookmark the permalink.